LOTTO: The numbers drawn were 7,13, 30, 6. Friday’s jackpot is €10,700. This is a fantastic way of supporting the club. Please sign up at Brayemmets.com. National Club Draw: The National Club Draw was officially launched in Croke Park on Tuesday. Last year, the Draw raised in excess of €2.4m for clubs throughout Ireland. All funds raised were retained solely by the club to assist in funding the development and the promotion of our games. Tickets cost €10 and are available in the club shop and from committee members. Please support this initiative by, pardon the pun, buying or selling tickets. Last year’s top prizes consisted of a trip to the 2014 International Rules series in Australia. (2 persons. Match tickets, airline tickets and accommodation.) 2. The Ultimate Football package 2014. (2 persons. All-Ireland Football Final tickets, All-Stars banquet & tour tickets to Boston.) 3. 2 Corporate Box concert tickets with pre-concert hospitality in Croke Park in 2014. And many more. This year there will be even more. Wicklow GAA Year Book: The Wicklow GAA Year Book is available from the club shop or from Anne Healy – There is great coverage of Bray Emmets with all our county wins covered. The Larry Walsh Cup & Club Christmas Night: The Competition will take place on Saturday 13th December, starting with the semi-finals at 2.45pm. The over 35s/Mentors game will take place at 4pm with the final of the cup starting at 5pm. The Christmas Party Night will also take place from 6.30pm in the clubhouse. Defibrillator Courses. Thanks to all of our members that completed the defibrillator courses in October and November. A special thanks to Brian Doyle for presenting the courses. Our AGM was held on Friday 28th November 2014 in our club house. The attendance was a little disappointing but we hope that is a reflection that the Executive Committee are running the club affairs to the satisfaction of the club members. The AGM was very efficiently run by our Chairman, Dermot O Brien assisted by our secretary Anne Healy and Treasurer Paul Cunningham. The Annual Report, compiled by our secretary, contained comprehensive details of club activity from members of management and all our team mentors. The revised Emmet Bhré Club Constitution and the five year Strategic Plan were also presented for discussion and ratification. The Chairman welcomed everyone to the meeting. Before moving on to the various reports, he brought to the attention of all present a very fitting tribute that Frances Stephenson had prepared for the Annual Report on the untimely death of our much loved and respected club member Déaglán Ó Maolmhuaidh. The tribute expresses how everyone in the club feels at the loss of Déaglán. Later in the meeting, a proposal that a “memorial” be located on our club grounds as an acknowledgement to our many deceased members who gave their time willingly to ensure the survival and development of Emmet Bhré, was fully supported. The Chairman in his report covered all aspects of the club activity. He congratulated all our teams that won championships and he particularly mentioned the achievements of the senior hurling team for winning our first championship in sixty two years. He highlighted the cost of running our club and the need for all club members to support all club fundraising activity. The secretary presented the Executive and Team mentor reports . The treasurer’s report was discussed at length and was excellently presented by Paul. Paul also highlighted the necessity for support from everyone for all fundraising events that are organised. Our PRO Gabriel Plower had to step down from the position due to other commitments. The Chairman thanked Gabriel for all the work he put in during the year for the club. The election of the incoming officers did not require the use of ballot papers as all were elected unopposed. Children’s Officer : Frances Stephenson. The Cathaoirleach na n-óg , (Juvenile-Chairman), Cathaoirleach na mban, (Ladies Chairperson), will be appointed by the executive committee. The revised Club Constitution and new five year Strategic Plan, which were previously circulated, were discussed at length. The club constitution was revised by Liam Mc Graynor with the assistance of the club chairman and secretary. The strategic plan was three years in the compiling and was commenced by Frances Stephenson and added to by the various review chairpersons that carried out reviews in 2013/14. The Chairman Dermot O Brien incorporated all those reviews into the strategic plan. The Constitution and Strategic Plan were unanimously passed. Our best wishes from all club members to the Executive Committee in 2015. The under twelve football team finished up the season playing Cuala on a beautiful morning in Old Conna. Playing three equal periods to ensure plenty of game time for everyone it was a good workout for the group. Thanks to Cuala for coming out and to the two young whistlers for officiating. The 2002 /2003 group had their medal presentation and quiz later that evening. There was great fun,funny answers, some dodgy singing and jokes with over forty five hungry boys making short work of the pizzas afterwards. Thanks to Brendan for compiling the questions and thanks to all who helped out on the day. Training has now finished for the year with the 2002 group moving up to under fourteens while the 2003s remaining at under twelve in 2015. On behalf of the coaches we hope everyone has a good break and will be rarin to go next year. Má tá suim agat teacht le chéile le Gaeilgeoirí eile sa chlub agus tá neart againn ann. Táimid ag iarraidh grúpa beag sóisialta a chur le chéile, oíche éigin in Emmet Bhré, agus beidh seans againn cúpla focal a labhairt agus taitneamh a bhaint as cupán tae Barry’s !! We are hoping to put together a group of Irish Speakers in the club. This would be organised on a very informal basis. We will meet for an hour in the clubhouse, on a night suitable for the majority, and while enjoying a cup of tea / biscuits have a chat. In order for us to get an idea of interested numbers – and pick the best night – can you please e-mail or text me your interest. Go raibh míle maith agaibh agus beimid ag labhairt le chéile go luath. at all Killruddery Christmas Markets between now and Christmas. 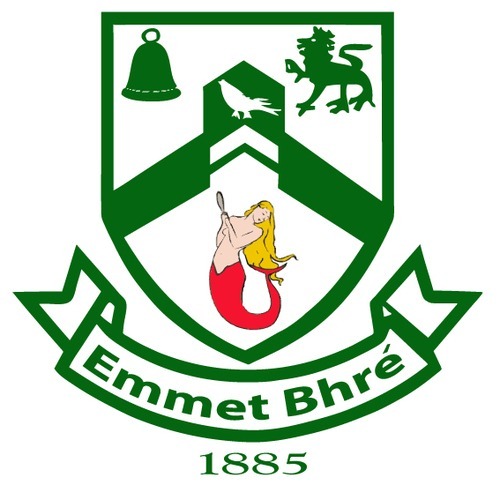 Just Say Pro Bray Emmets!!! Markets run Saturday and Sunday through out December. please quote Pro Bray Emmets when you order, to receive your discount.